Justin Timberlake/Jay-Z concert recap. 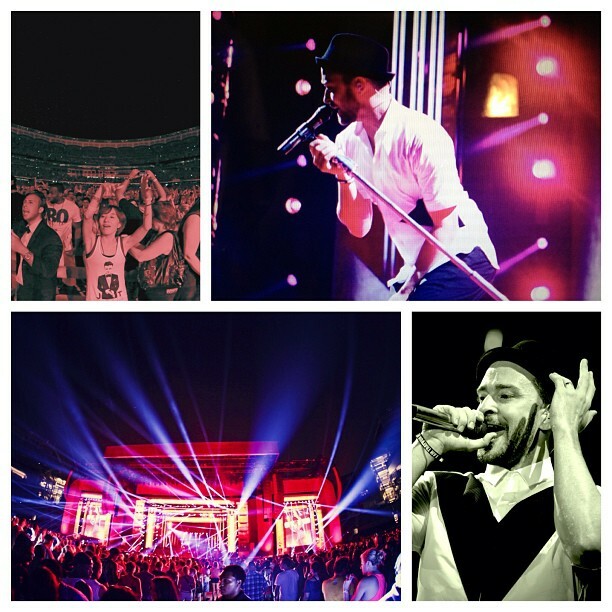 Photo: Justin Timberlake Facebook page. Do you have 99 problems, but don’t want parking to be one of them? Sunday, July 28 will boast nearly 60,000 fans to the Rose Bowl for the highly anticipated Justin Timberlake and Jay-Z Legends of the Summer tour. Because of this, considerable traffic, congested streets and limited parking are expected around the stadium. To bypass this unwanted headache, take the Metro Gold Line to the Memorial Park Station and transfer to the Rose Bowl shuttle to get to the show. Metro will be extending the hours on its rail lines and the Orange and Silver Lines until early in the following morning so getting home after the show won’t be a problem. North to Sierra Madre Villa will leave Memorial Park at 1:20 a.m.
East to Norwalk will leave Imperial/Wilmington at 2:37 a.m.
West to Redondo Beach will leave Imperial/Wilmington at 2:37 a.m.
Leave North Hollywood at 1:15 am, 1:35 am, 1:55 am; 2:15 am and 2:30 am. There will be Rose Bowl shuttle service three blocks away from the Memorial Park Station to take concertgoers to and from the Rose Bowl. A round-trip ride will cost $10 the day of the show. The shuttle will be stationed at Parsons Engineering, 100 W. Walnut Street. The shuttle buses will run before and after the concert between Parsons and the Rose Bowl. Shuttle service will begin at noon and continue after the show until 1 a.m.
For more details on getting to the concert via Metro, go to the Trip Planner at metro.net. Too bad they are charging $10 for the shuttle, which will surely depress ridership. And who, pray tell, is paying for the two extra hours of transit service, especially on a Sunday night, one of the lowest ridership nights out there (since most stores close early and there are no ball games to spike ridership)? $10 for the shuttle is a lot better than charging $40+ for parking. Anyone know what time they will actually go on tonight? Calwatch, they need to charge in order to offset the costs, but it’s still cheap compared to the cost of gas and parking. The taxpayers of LA county are obviously absorbing the cost of the extra two hours of service. Why would anyone want to see these two idiots? Their singing act is bad if they have to perform together! I’m not opposed to the added service, but Metro should have made a deal with the concert organizers similar to the ones they do for Hard Festival where they pay for the added service. At least when Metro adds service for football games, they are running during normal operating hours and it does not disrupt maintenance schedules – the normal Sunday night maintenance was moved to Friday night this past weekend, which didn’t make Dodger fans that took the subway very happy. For Rose Bowl football games the shuttle is free – I understand that this is different but many fans will prefer to carpool with their friends, which is cheaper and more convenient than the shuttle if you have a full car load. I still don’t think this is a great deal for people who couldn’t care less about Jay-Z and JT. But who goes to a concert alone? If you’re going to a concert, people will be going with a group of friends. Split the $40 parking with four people in the car, comes down to the same $10.